If your concrete is sinking... there is a very good possibility that the concrete slab was installed on poorly compacted fill dirt. Sub-surface erosion and shrinking soils are also possibilities. However, as Sarnia and surrounding area residents you are fortunate enough to have a concrete leveler in your area, and therefore you should not have spend thousands of dollars to replace the existing concrete. Sarnia Paving Stone Ltd. can float a slab back to its original position by pumping an environmentally friendly sand mixture beneath your slab. 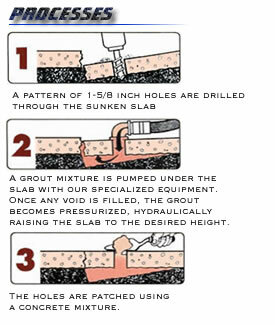 Concrete leveling is a process, which hydraulically lifts your existing concrete to its original position. » No disruption or replacement of landscaping.